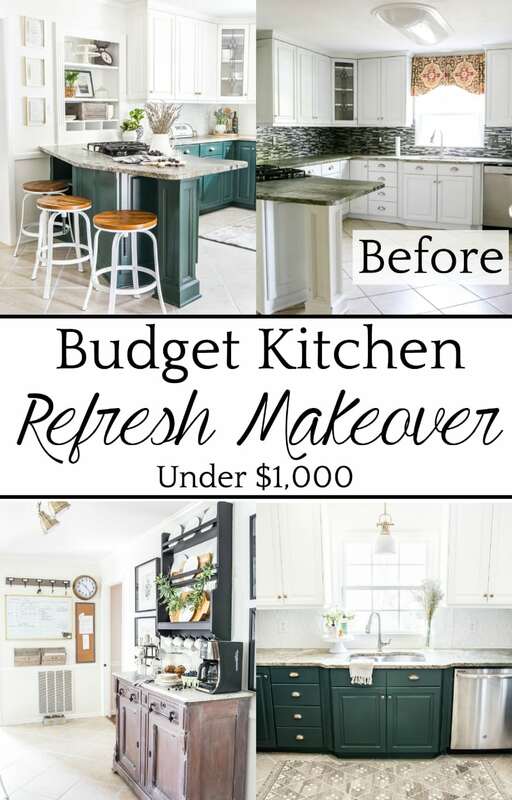 A budget kitchen refresh that turns a dated kitchen into a two-tone modern space using paint, inexpensive DIY projects, and small changes for a big impact. 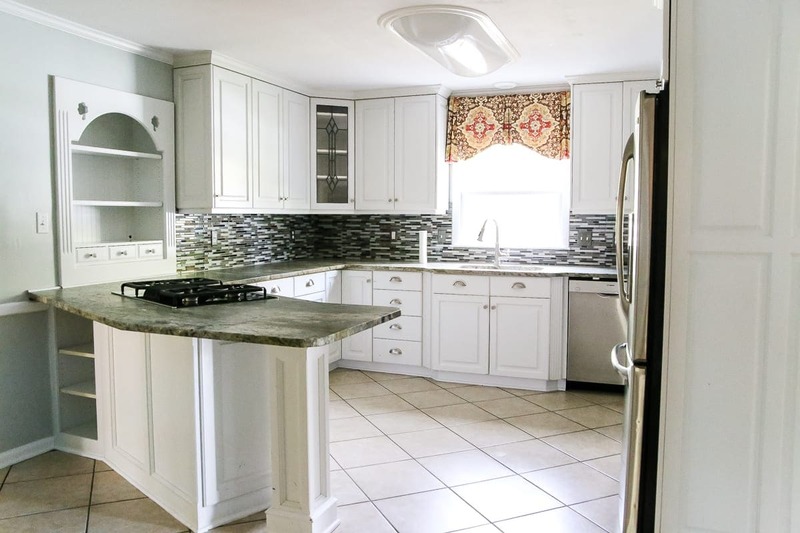 You know how you watch those makeover shows on HGTV and there is always this crazy amazing before and after with a new open concept and new lighting and new cabinets and new countertops and new flooring and a big lovely price tag of $50,000? That’s cool and all. And yeah, I still watch them because hello? They’re amazing! I really have to tell myself sometimes that those reality shows are not, in fact, always reality. Because I start to wish for that life instead of being thankful for what I already have. 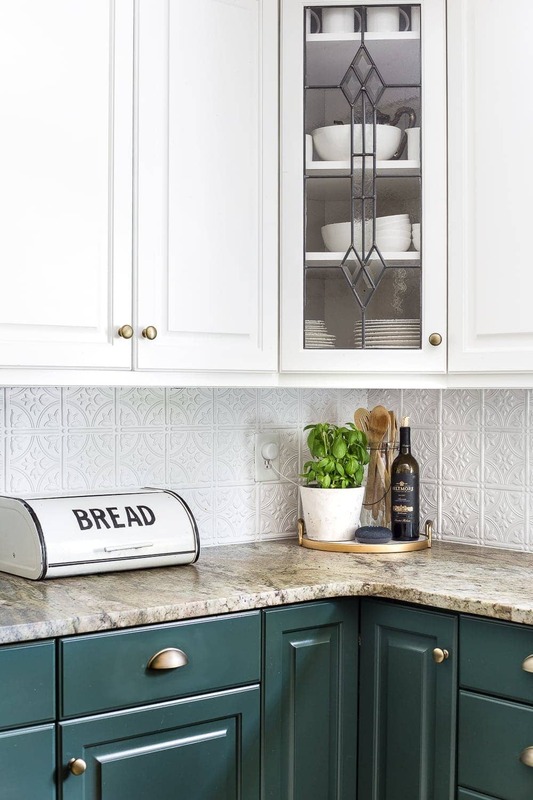 Our latest kitchen refresh was the reminder I needed. It’s been so easy to tell myself for the last year that eventually the dated floors will be replaced. Eventually, we’ll take down a wall to make this kitchen bigger. Eventually, we’ll demo the backsplash and remove the countertop for something more our style. But you know what? No one said you had to live with something you didn’t love until you could save up $10,000 for it. Go all Tim Gunn on that room and make it work! And maybe you’ll see the beauty that was there all along just begging to be noticed. That’s been the lesson for me at least these past couple of months. So now, after mainly just using paint, inexpensive DIYs, and a few small changes, it looks like this. 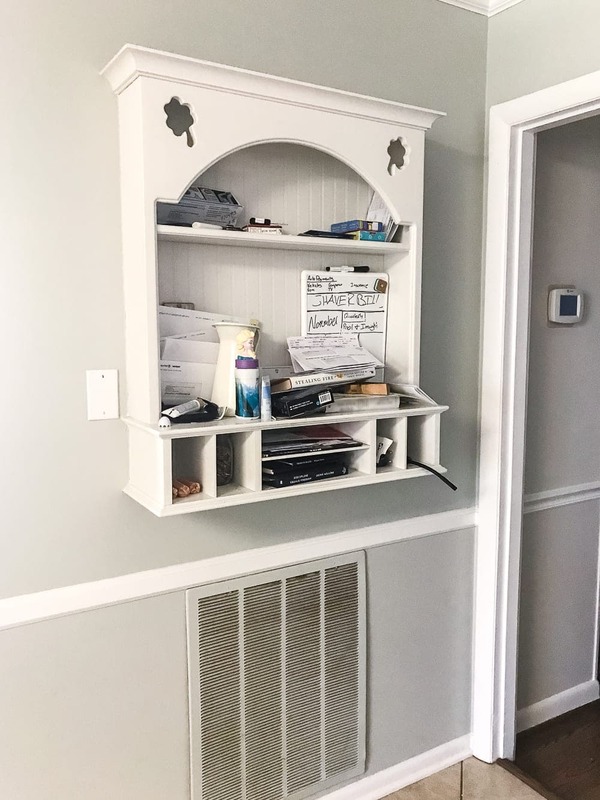 Robert was really the one who convinced me that we could do something great with this space because when he brought it up during my first trimester of this pregnancy, I really was NOT feeling up to this makeover. To be fair, it was a nice kitchen to begin with since it already had cabinets that were less than 30 years old (younger than our 58 year old house). They were yellowed and scuffed up before, but it was nothing paint couldn’t fix. Robert scrubbed them all over and used our tried and true DIY cabinet painting technique from our old house to paint the uppers with Benjamin Moore Simply White (our go-to bright white) and the lowers with Sherwin Williams Billiard to add some personality and contrast to the space. 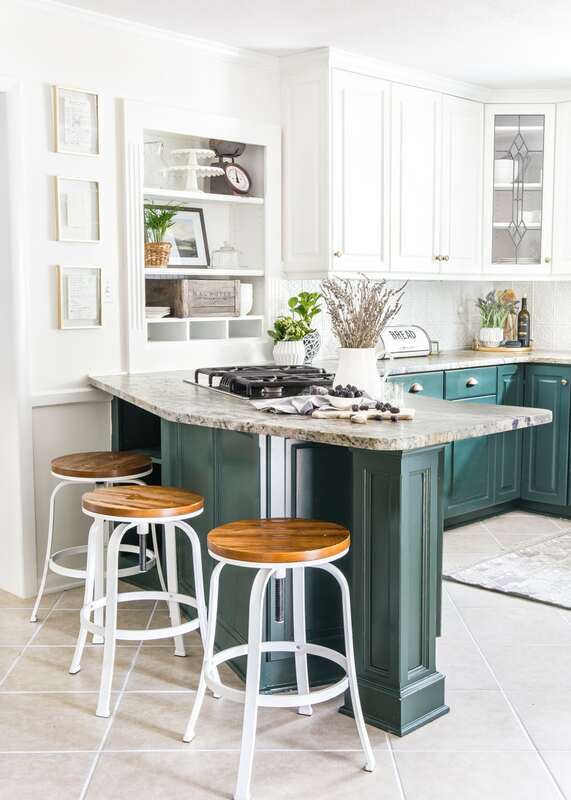 The dark green popped so well against our white barstools we hauled over with us from our move. We ended up replacing the knobs and pulls too with these aged brass cup pulls and knobs to incorporate some warmth. 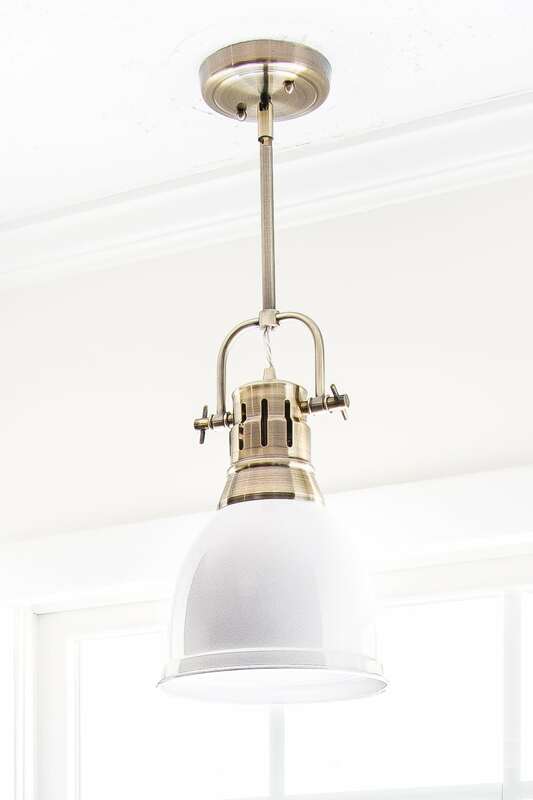 And for above the sink, we replaced the canned light with this aged brass and white enamel pendant to tie together the traditional-meets-farmhouse-meets-modern look we love. 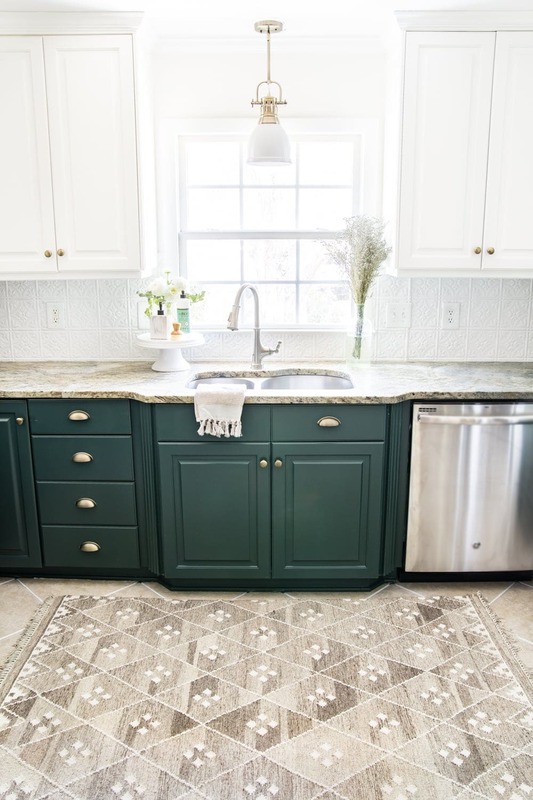 Since we have to leave the tile floor alone for now, I just brightened up the grout with a grout pen and added this wool rug (which helps repel stains) with a memory foam pad underneath to make washing dishes at our sink more comfortable on our backs. 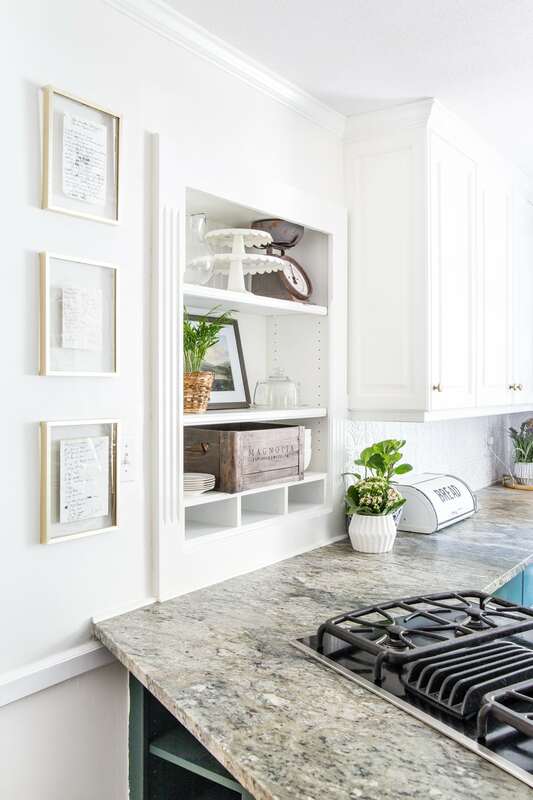 Last summer, we tackled this backsplash as one of our very first projects in this house since we felt it made the room feel a little too busy. As a temporary solution until we can manage a full backsplash demo and replacement, we covered it with this pressed ceiling tile look paneling. I love that it is simple but still has a subtle pattern to it. 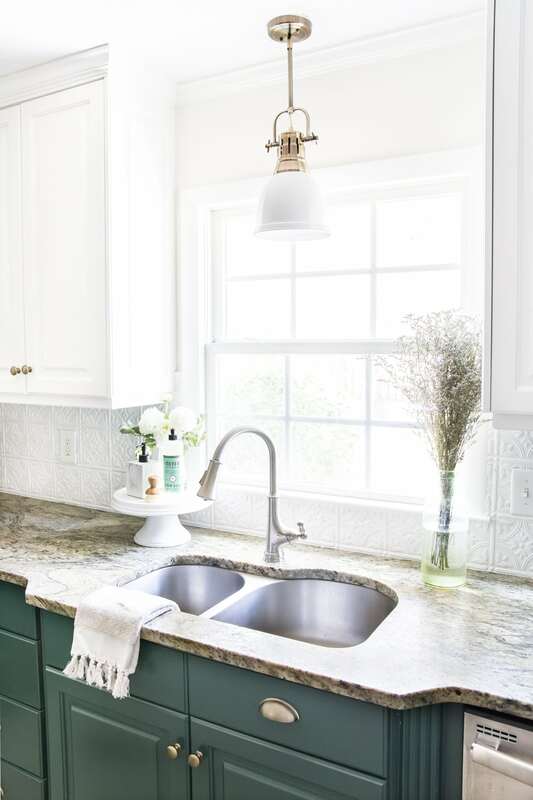 And it draws the spotlight to our existing leathered countertops, which is the whole reason why we chose green for our lower cabinets to “make it work”. 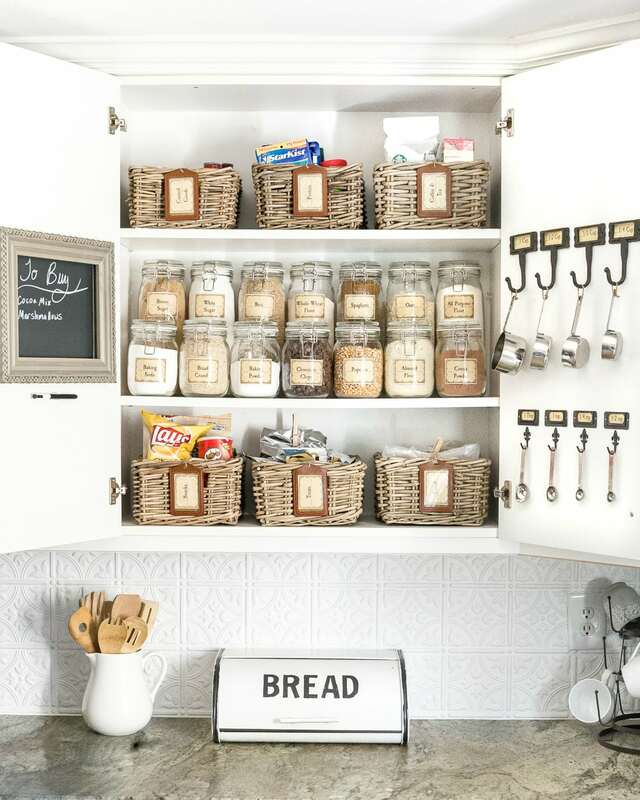 While we were in “kitchen makeovering mode”, we organized the inside of the cabinets too. The opposite side of the room had this totally blank wall behind our peninsula bar when we moved in, but we really needed some extra storage. Once I found this marble top buffet at the thrift store, it all fell into place. 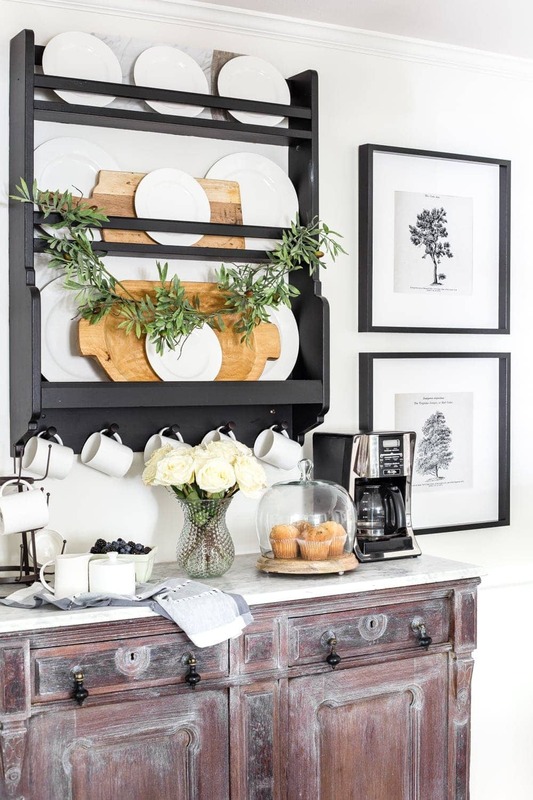 I cleaned it up and white waxed it to keep the rough texture, and we hung this IKEA plate rack above that I painted with Fusion Mineral Paint Coal Black for extra dish/mug storage. It’s become our happy little coffee spot. 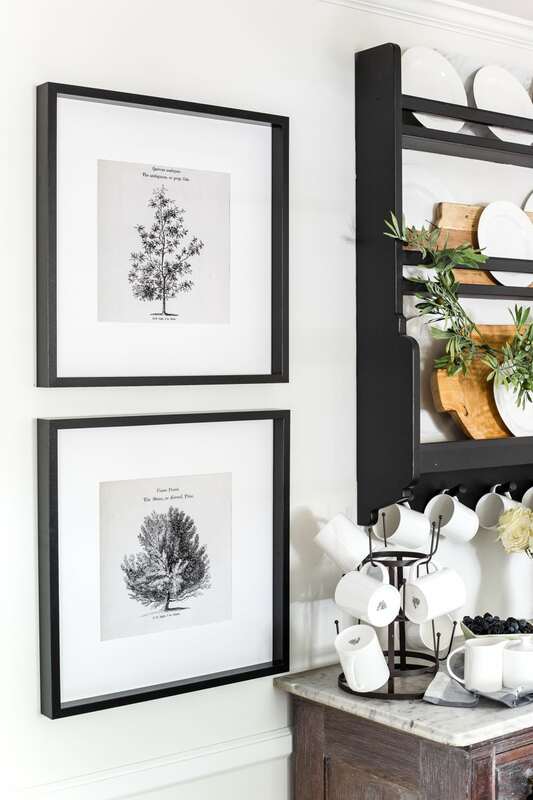 I found these public domain images of vintage arbor art too that I just placed in $15 IKEA frames and hung them up on either side to fill up the wall. On the wall beside it, we originally had a shelf that we discovered was a total clutter collector. 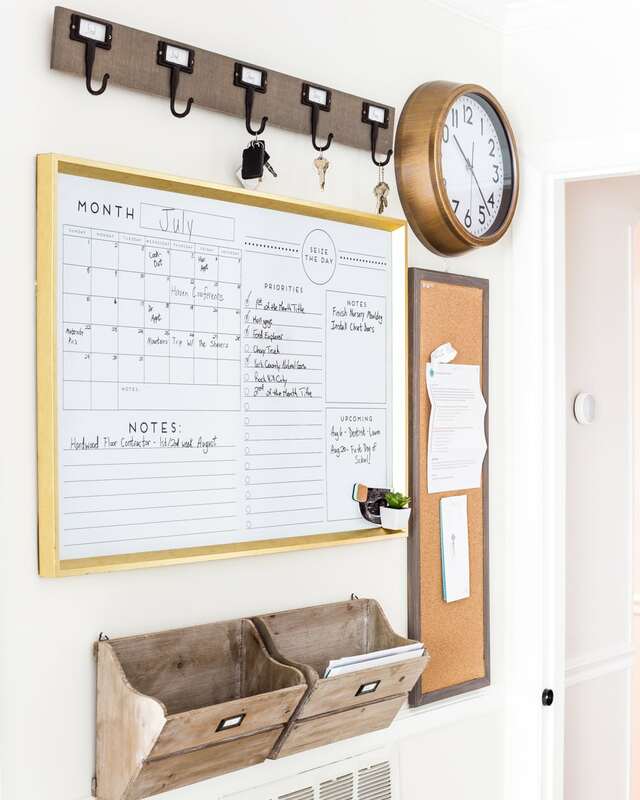 So we took it down, painted the walls with a creamy white Benjamin Moore Swiss Coffee to make this dark room feel brighter, and added a command center to keep us more organized. And now it’s so. much. better! Everything now has a place, but with the shelf gone, we’re not tempted to throw random junk in this corner. This wall beside our stove originally had a built-in shelf similar to the command center one, but Robert just used the jigsaw to remove the arch and shamrock cut-outs to make it streamlined. 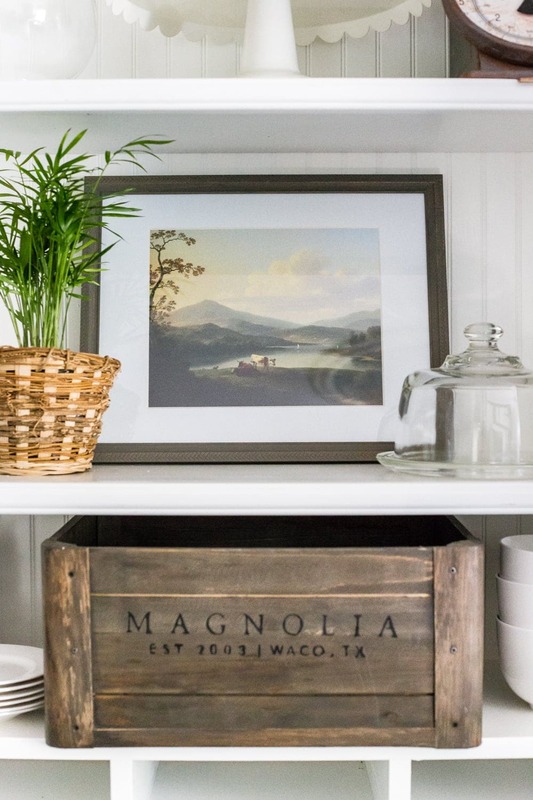 So I added serving pieces we typically only use for entertaining along with this thrift scale I painted to look like an antique, this crate we use for holding our unsorted mail, and this thrifted frame I just put a $3 Etsy print in. Pecan pie is Robert’s favorite, and since I hung it up on the wall, this recipe has already been requested. It’s taken a lot of re-imagining and sweat, but this kitchen finally does feel like home. And even though we do plan to eventually do the big HGTV-level renovation, I’m so glad we can wait 5-ish years and not feel rushed to make that happen. Home wasn’t built in a day, right? This looks amazing. What a beautiful makeover. Nice kitchen before, Gorgeous kitchen now! I really ? the color u used for lower cabs. What a beautiful makeover. Love absolutely everything, especially the colour of the lower cabinets. Thank you, Julie! They’re certainly different from any other color I’ve tried. Gorgeous results, Lauren. I was looking into that landscape print, but it appears neither of the affiliate links are working. Any ideas? I love the inspiration from your blog. Love this demonstration of creativity meeting sweat equity to improve a space! 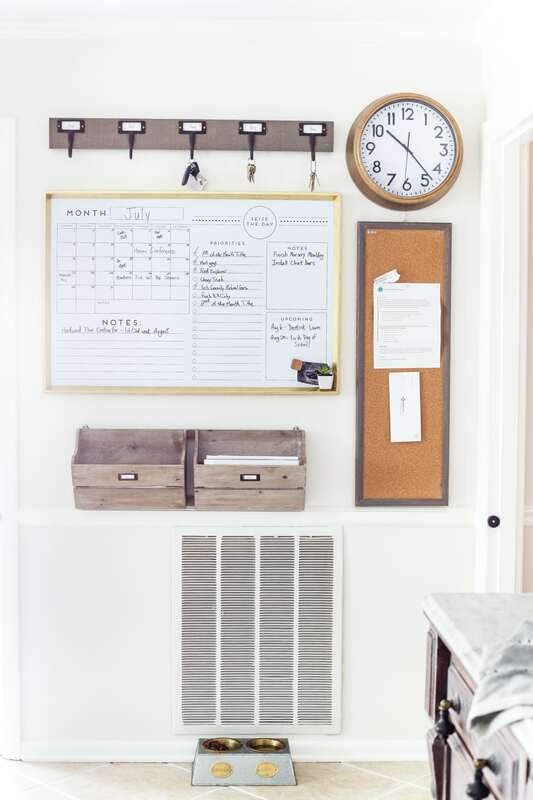 Rethinking a space has hidden benefits. 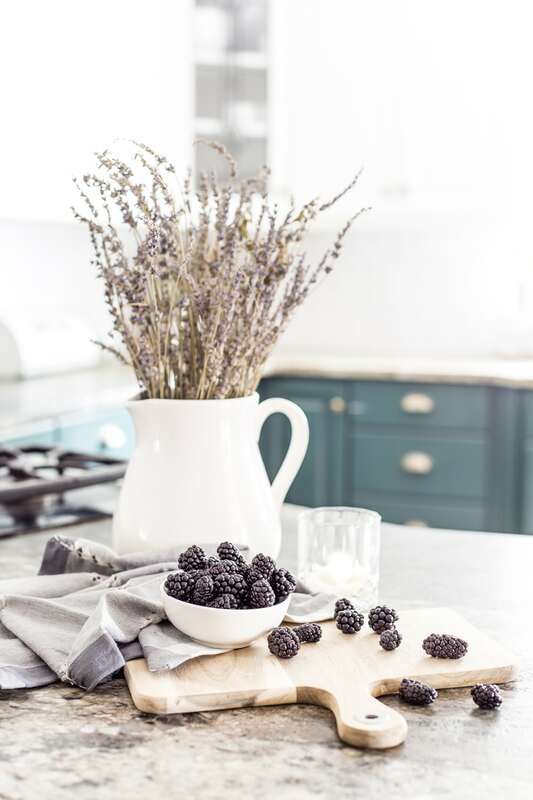 It forces you to look at what you have & placing a value on it, like your family recipes which are displayed beautifully, make the kitchen truly yours & become a conversation piece. Hi there – everything looks so amazing – wonderful job !! 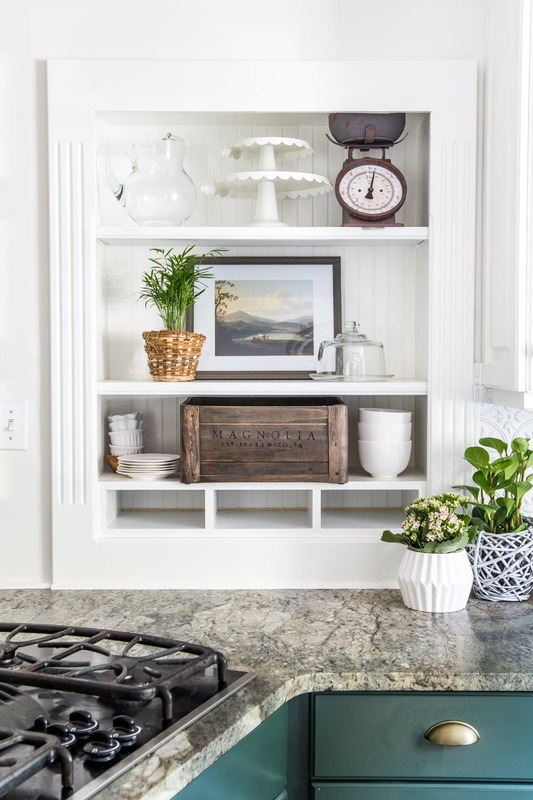 Wondering where you got the Herb racks by your kitchen table ? Oh what I’d do to have your “old” kitchen! It would be a blessing. So in 5 years or so, when you get ready to ditch it all for your $$50,000 makeover, will you please gift me all the cabinets you rip out? Absolutely stunning! Thanks so much for sharing!! What a beautiful kitchen! Once again you and your husband have outdone yourselves in renovating another amazing room in your beautiful home! Love how you not only worked with what you had, but enhanced the beauty with your color choices. I love the personal touches which make it truly your home! I find endless inspiration in your blog and appreciate your creativity-on-a-budget mindset! You’re the best! Thank you so much for the kind words, Julianna. We hope to enjoy it for years to come. I’m loving the light above the sink. We have a recessed light that is so blah. I am going to be keeping my eye out for a light! Yesterday I picked up a file cabinet for $15 from someone on FB. It took up the entire back of the Rogue. The dog had to sit up front with my daughter. On my way home I rode past some curb alert furniture in front of a large “ritzier house”. A beautiful chaise, a Queen Anne chair and a nice wingback. All upholstered and looked pretty clean. I screamed “oooooh” like I was having a heart attack. No room in the cAr!!!!!! Our pickup needs a new engine and has been out of commission for months so I cry a lot when I can’t get stuff. 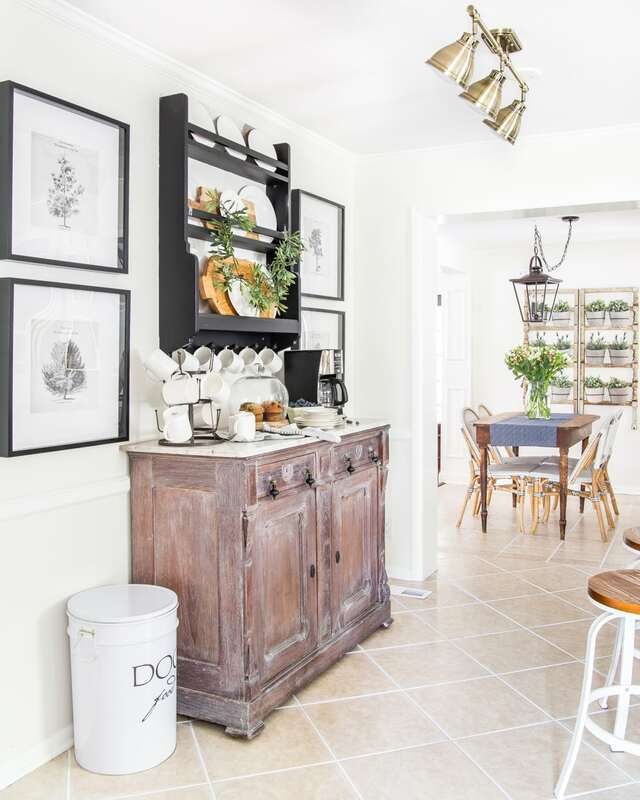 Lauren – your bridge reno is gorgeous – love your style and honesty. Looks GREAT! to know where you got your board, and what the dimensions are. I am on the lookout for one and thought yours would be a good place to start looking. Thank you! I fixed the link. Thank you. The dry erase board came from HomeGoods. I do have a link in the post but is not the exact same one but might get you started with yours. Lauren, you guys did such a great job, your kitchen looks wonderful. 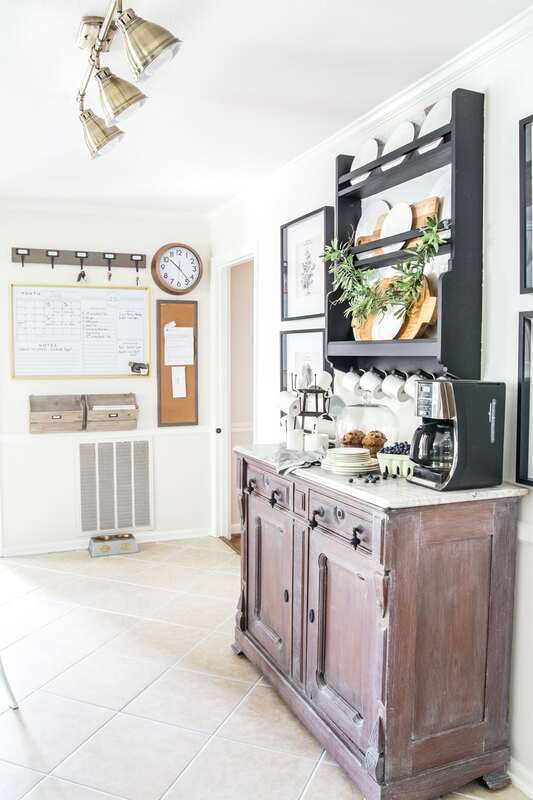 I really like the color of the lower cabinets, and I love the coffee bar. I also looked for that little print and couldn’t find it but will try again. Hope you are able to take a little break and rest up before the baby arrives. Job well done. Lauren, your kitchen “before” was perfect for me! The redo is great too. My house was built in 1948 and the kitchen appears to be the original. Yikes! I am inspired by all the things on your site. Thank you. Thank you Esther. Good luck with your own redo! This is the perfect example of achieving a fresh look without breaking the bank Lauren. 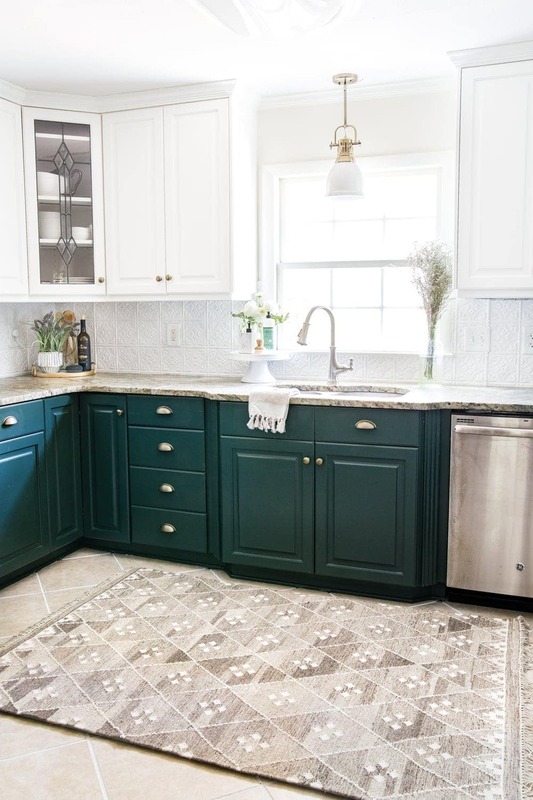 Love those green cabinets. Great work Lauren! I really liked the dry erase board but the affiliate link led me to a glass pitcher. Do you by chance have an updated link? Hi Lauren, your kitchen revamp is beautiful. Clean, bright and crisp are a few adjectives that come to mind. Love the coffee bar. Of course, I love everything you have done to both of your houses. I love everything about this! Great example of working with what you have and still making it yours, beautiful and functional! Super inspiring. Lauren, the kitchen is beautiful! I love the green. It really does look like a brand new kitchen. Just lovely Lauren!! I really love your framed family recipes! So very sweet! I love your refreshed kitchen. 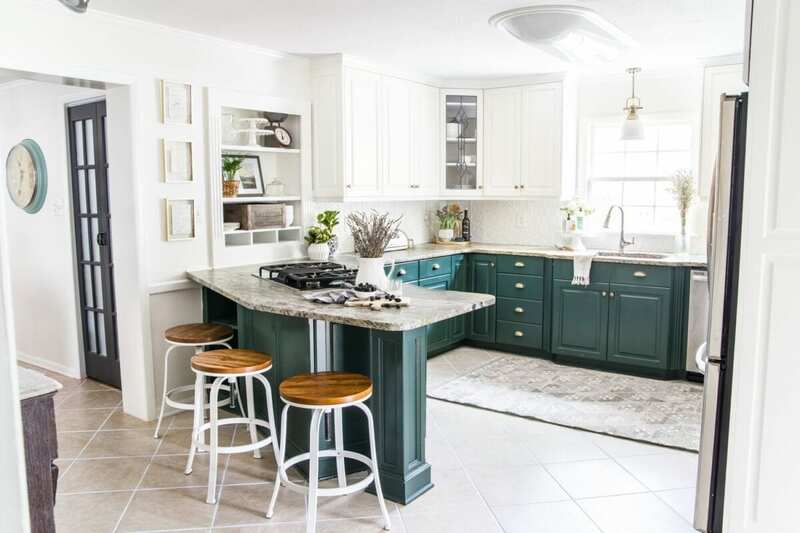 You chose a beautiful color for the lower cabinets. The light fixture over the sink and the updated track lighting make a huge difference! I need to replace some track lighting and had not thought of replacing it with updated track lighting! I think you solved a big problem for me. My favorite thing of all is the floating frames with the recipes. 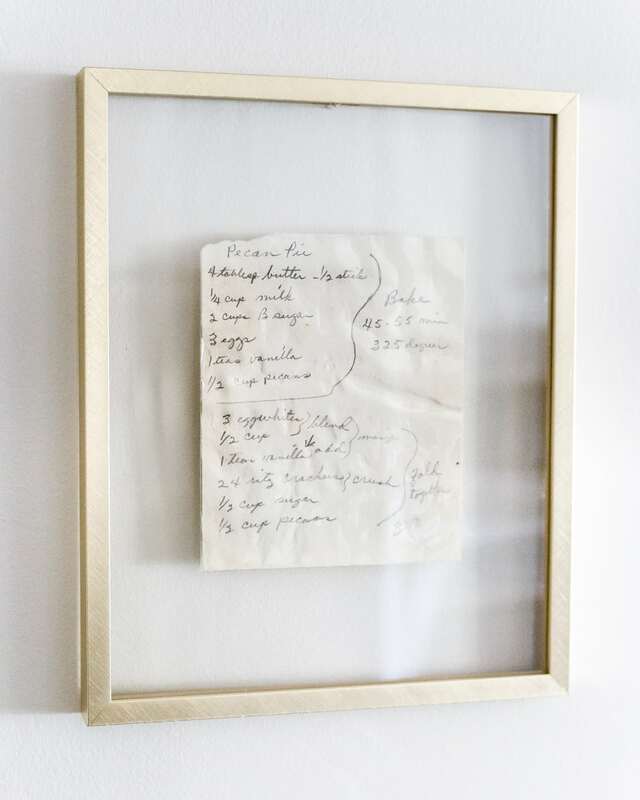 Being a lover of all things history and family, the idea of using some of the handwritten recipes I have from my grandmother, aunt and mother would be perfect in my kitchen. Thank you so much for all of the great ideas and proving once again that you don’t have to spend a fortune to make your house beautiful and comfortable in your own style. Everything is stunning. I love how you framed you priceless recipes of you mom and grandmother. 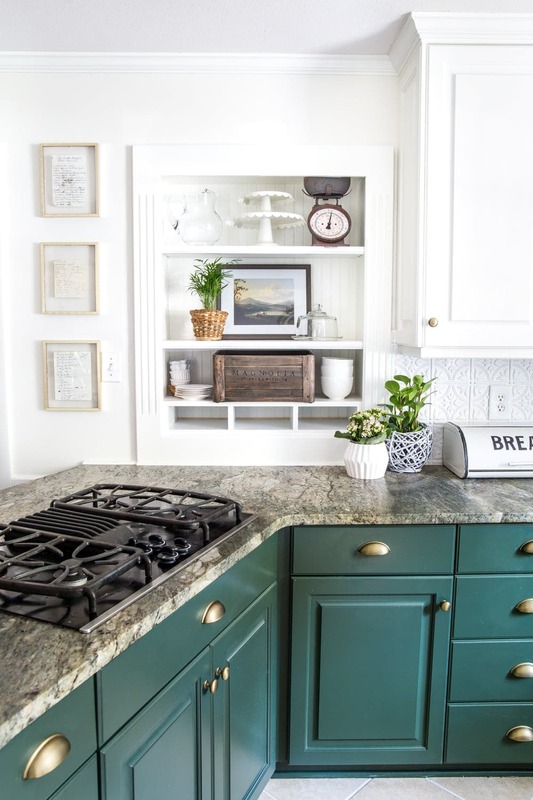 I am so in love with the color you selected to paint your cabinets. I used this color for our home office, and I love it! You decorative style always take my breath away, with its fabulousness. Thanks for sharing all your wonderful styles, I love everything you post. Lauren your kitchen looks gorgeous! I love the contrast of that green with the white, it really makes a statement. Beautiful job! Beautiful new kitchen! I’d like to do some of these things in my house. I’m wondering how the grout pen holds up and if you know how long it is before you have to do it again? 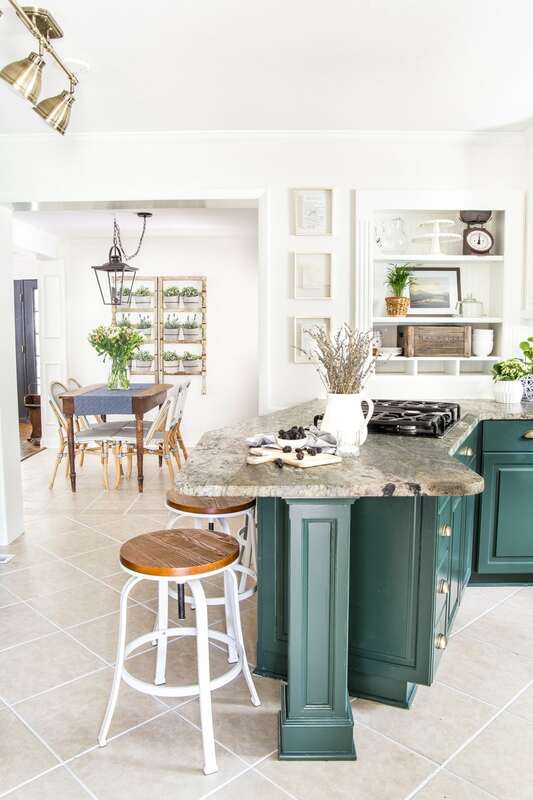 Also, do you know if I could put that pressed ceiling tile look paneling over my glossy ceramic tile backsplash and what kind of prep I would need to do? It looks great Lauren! I keep telling myself the same thing about home being built in a day! It will all come together eventually! Congrats on a terrific job! Beautiful! 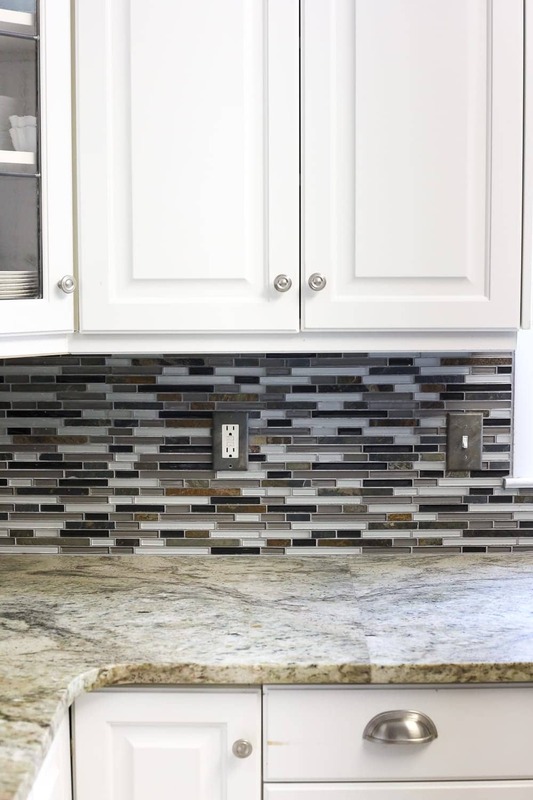 Did you use the Gloss White or the Matte White for your backsplash? Absolutely beautiful kitchen makeover. Thank you for providing real life, applicable, budget friendly solutions that have such style! 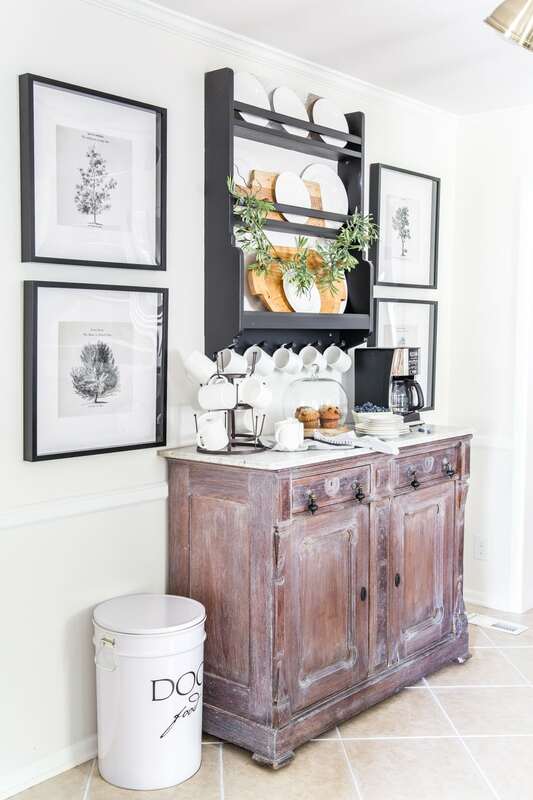 While I love looking at other bloggers homes, many seem like such a big cost is involved to achieve the look. It’s easy to become discontent. 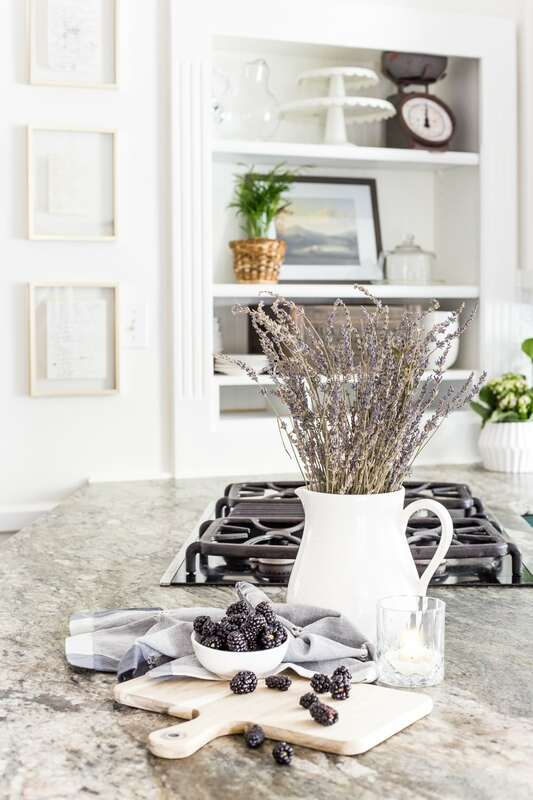 Even if you never do a bigger reno, this kitchen is fab! You truly inspired many just like me, I’m sure! AWE! You are so very welcome. Thank you for joining our journey.